Want a simple strategy for investing in cryptocurrencies like Bitcoin (BTC)? Then you need to know about dollar-cost averaging (DCA). In this short post, I’ll overview what dollar-cost averaging is and how it can reduce your risk exposure, blood pressure, and get you investing ASAP. Remember: I’m not a financial advisor and this isn’t investment advice. Find my full disclaimer here. Dollar-cost averaging (DCA) is where you buy a defined dollar (or any other fiat currency) amount of an investment at a fixed interval, regardless of that investment’s price at that moment in time. You’re spreading your investment over a longer time period in regular and equal proportions instead of purchasing your investment in one lump-sum. Instead of buying £13000 worth of Bitcoin in one lump-sum, you could purchase £250 worth of Bitcoin every week for an entire year at the market-rate (regardless of what that price is). You’ll invest the same amount by the end of the year by using this investment strategy, but your average Bitcoin purchase price will be different (hopefully better – but more on this lower down). Reduces your volatility in the long-term, by averaging out your purchase price. Don’t have to worry about investing at an all-time high, because you’re not trying to perfectly time the market. It gets you started (with a plan) quickly. It can be difficult to work out when to buy and sell in such a volatile market, which leads you to decision paralysis (i.e., you do nothing). It’s a simple strategy. You don’t need to do any technical analysis (or access to a Delorian time machine). How much you’re looking to invest. Consider lump sums available now, as well as any spare change you have each month. How many weeks you’d like to divide this between. Higher risk exposure when you invest less frequently (e.g., once every month). Lower risk exposure when you invest more frequently (e.g., once a week). Where will you buy Bitcoin? The easiest option in the UK is Vimba. Check out my Vimba review to learn more. If you purchase during significant price corrections, purchasing in one giant lump sum can generate better long-term returns. However, picking the perfect time to buy-in is difficult. What happens if you invest all your available funds into Bitcoin at £5000, but then it falls a further 20%? You’ve already invested all your funds, so what else can you do? You could try to scrape together some additional funds. But if you can’t, you would be stuck sitting on the bench – unable to take advantage of this lower price. You don’t face this problem if you’re dollar-cost averaging. You’ll passively take advantage of such price movements without any stress. However, the returns from dollar-cost averaging into an investment can be lower than just buying in a one-off lump sum. But the risk you’re exposed to is lower too. This is because the impact of buying at any one moment in time is less. Share this post with those it could help (see below). Take steps to protect your bitcoin & cryptocurrency. 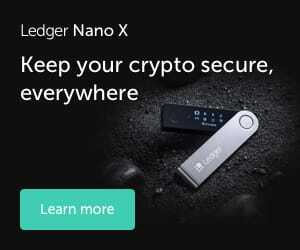 Purchase a hardware wallet like the Ledger Nano S.